As outrage still reverberates among opposition supporters over Tuesday’s conviction of 11 Cambodia National Rescue Party activists on “insurrection” charges, the ruling Cambodian People’s Party has warned that questioning the verdict will imperil the ongoing “culture of dialogue”. In a statement issued late on Wednesday, the CPP stated that the culture of dialogue can only be maintained by showing respect to the constitution, in which the independence of the judiciary is enshrined. “Cambodia has no political prisoners, [only] politicians who commit offences and are punished by law,” the statement reads. The statement comes as indignation continues to be expressed by opposition supporters and NGOs, who say the verdict was politically motivated and a clear indication of judicial bias. The 11 activists were sentenced to between seven and 20 years for their role in a July 2014 demonstration that turned violent in Phnom Penh’s Freedom Park. Participants were protesting a ban on public gatherings in the park, which is a space traditionally reserved for political rallies. Human Rights Watch has previously stated it has video evidence that the violence, which saw a number of Dauh Penh district’s notorious security guards severely beaten, was instigated by the irregular government forces. Senior investigator at rights group Licadho Am Sam Ath yesterday slammed the CPP’s claims that the courts are independent, pointing to the fact that jailed opposition activists had only received bail since the start of the “culture of dialogue” between the ruling and opposition parties. “This clearly shows that the courts are not independent,” he said. 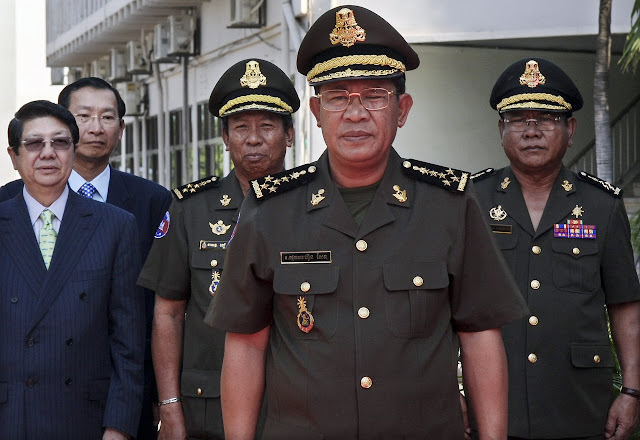 In a statement released yesterday by the Cambodian Center for Human Rights, 11 civil society groups condemned Tuesday’s verdict, saying it was “based on trumped-up charges and characterized by a total disrespect for fair trial rights”. “No credible evidence supporting the claim that the defendants had planned an ‘insurrection,’ or that any of the 11 had themselves committed acts of violence, was produced during the trial,” the statement says. Speaking yesterday, the president of rights group Adhoc, Thun Saray, said the CPP’s attempt to banish all objection from the ongoing rapprochement with the CNRP was anti-democratic. “Criticism and the culture of dialogue must go hand-in-hand, because this is a multi-party democracy,” Saray said. 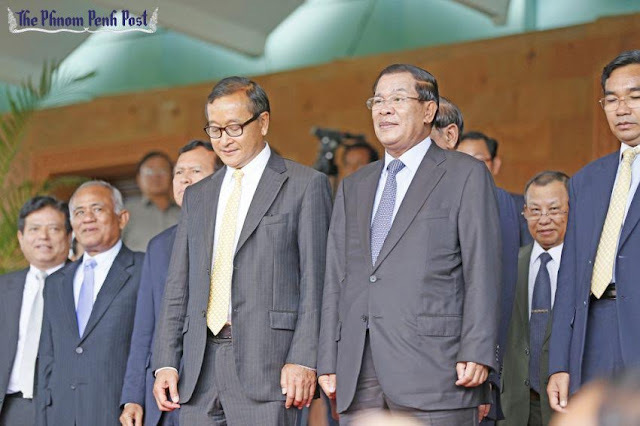 However, that goodwill appears to be increasingly strained, despite CNRP leader Sam Rainsy praising the culture of dialogue on his Facebook page on the same day the 11 were sentenced – a post widely criticised as insensitive by supporters. In a statement released by the opposition leader yesterday, in which he also responded to outrage over his decision to leave for France despite the sentences, Rainsy labelled the verdict “a brutal act of repression”. “There will be other appropriate actions and measures we will take on several fronts in the coming days,” he said. Hostile takeover: How Cambodia’s ruling family are pulling the strings on the economy and amassing vast personal fortunes with extreme consequences for the population.